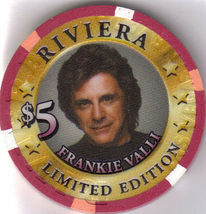 This is an authentic, obsolete 5 Limited Edition 700 Casino Chip made by the RIVIERA Hotel Casino, Las Vegas, NV featuring FRANKIE VALLI in Concert December 31, 2001. Frankie Valli (born Francis Stephen Castellucio is an American musician, most famous as frontman of The FOUR SEASONS. He is well-known for his unusually powerful Falsetto singing voice. 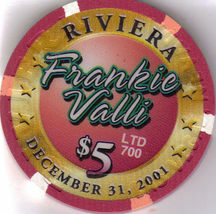 Valli, Tommy DeVita, Nick Massi Bob Gaudio (the original cast of The FOUR SEASONS), were inducted into the Rock Roll Hall of Fame in 1990 and the vocal Group Hall of Fame in 1999. Chip measures 1-1/2" in diameter, Used/Circulated Send email if you need additional details about this chip. Buyer is responsible for 3.95 for postage and handling within the USA. International shipping rates apply. Shipping always combined on multiple purchases. Don't forget to check my store for many more Las Vegas Collections! Thanks for stopping by!